Sonic Forces came out about a month ago and it's gotten some very mediocre reviews and I think that we are at the point where the boost style of gameplay should be abandoned for good. (Not saying they are bad, I'm just saying it's becoming an over-milked concept) I'm afraid that if they do another boost title it'll be a critical disaster. Sonic 06 came out 11 years ago and that was the last game to incorporate elements from the Adventure titles and I think that it should be given another shot, just like with Sonic Mania. Speaking of Mania maybe they can do what they did with Sonic Mania and get a bunch of people who know the Adventure games like the back of their hands and get them to work on their own project. The Adventure games are what defined Sonic as a 3D platformer rather than the boost titles which most platforming is done in the 2D perspective. Only time will tell if this becomes a reality and if it does I know that I will be happy. Let's also not forget that this current Sonic Team could never even a million years recreate the Adventure style feeling and gameplay even if their lives depended on it. If simply recreating the classic 2D games was an impossible task for them (Sonic 4), then they have no chance of ever getting even close to the Adventure formula in a 3D space. Plus, there's also the little fact that they have been doing everything they could to distance Sonic from what he/the franchise was in the Dreamcast/Adventure days: they changed the tone, changed the voices, changed the gameplay approach, changed the music style..you could argue that Forces was an attempt to get back to that, but if that was their best shot at it, they clearly have no idea what they are doing at this point. Tarnish wrote: Let's also not forget that this current Sonic Team could never even a million years recreate the Adventure style feeling and gameplay even if their lives depended on it. If simply recreating the classic 2D games was an impossible task for them (Sonic 4), then they have no chance of ever getting even close to the Adventure formula in a 3D space. That is sadly true Tarnish. There is a quite good video on why Sonic never was a good game (making very valid points about the first few sonic games). mstar wrote: There is a quite good video on why Sonic never was a good game (making very valid points about the first few sonic games). You make it sound like being fast paced was its only thing, which is wrong. The way I see it, a good Sonic game has a good balance and mixture of 3 things: speed, platforming and exploration. To achieve this, the classic Sonic games split the stages into different sections: fast paced sections where there were little to no obstacles in the characters way to allow for high speed running/rolling without taking damage (Sonic 2's Chemical Plant is an excellent example of such sections), and slower sections filled with enemies and platforming requiring precision that also allowed for exploration. The Genesis/Mega Drive games did this well, so the "Sonic never was a good game" statement just comes across as stupid imo. I agree with Tarnish on the "Sonic was never good" subject. The first thing that made me think about why Sonic games (generally) are good was when IGN insulted the fanbase back in 2016. Even if you don't like the speedy gameplay, there are plenty of things to admire; the level design (mostly), the graphics and the music are some of these. I don't really know what these people are talking about; I've never had problems seeing where I'm going in a Sonic game unless it's Sonic 2 on GG. In the midst of all of the horrible '90s platform mascots, Sonic stood out for having quality games throughout the decade, including the original trilogy, some of the best 16-bit platformers ever made. The Adventure series continued the success into 3D, then it went downhill from there. 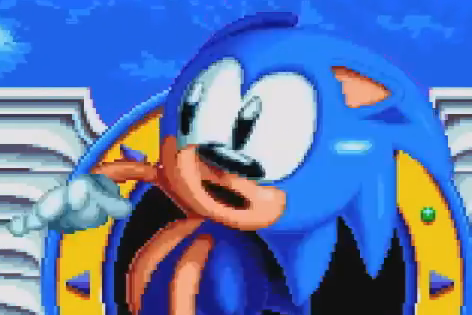 SomeGuyWithASega wrote: I've never had problems seeing where I'm going in a Sonic game unless it's Sonic 2 on GG. I mean I see the logic behind the statement, if Sonic is running fast enough, obstacles and enemies are coming at such a fast pace that by the time the player may notice them, Sonic had already ran into them. Above a certain speed, the player doesn't have enough time to react. But like I said, the designers of the classic games avoided such situations happening by making speedy sections obstacle and enemy free. Sections where there are obstacles and enemies, the player is slowed down by the stage design itself: a well placed spike (protruding from the ground so that the character runs into its side, not taking damage), spring or higher platform requiring a jump. It's pretty much guaranteed that the player enters these sections with a low enough speed to have enough time to react for awaiting obstacles and enemies. Well, I for one like the first Sonic Adventure for being more slow paced, I don't like the Adventure 2 that much. I am a completionist and like to explore every inch of the map/level. Even as a kid, Sonic games were never about speed to me, but more for its pure platforming gameplay (2D games) and exploration (3D/Adventure games).